A portion of the setlist, submitted by ? "Off your knees, Boston" Morrissey greeted the crowd, wearing all black. Around the venue were signs posted informing people that anyone attempting to set foot on the stage would be ejected from the show. Also, security down on the floor was pretty tight. Perhaps a bit frustrated at the lack of movement (or something else), Morrissey gestured several times for audiences to come forward and during "The More You Ignore Me" he seemed to stop singing about halfway through the song, humming the words instead. After the song he said "I must warn you about something -- if you come on the stage... you have me to deal with". During "Roy's Keen" one person tried to get on, but was held back by several security guards. Morrissey went over and made a great effort to pull him onto the stage and was successful. About 5 others made it onto the stage after that. Later in the show Morrissey asked the crowd "Is it nice to live in Boston?" (cheers) "Is it very nice?" The encore "Shoplifters" began with another brief stage rush, but security was quick and cleared the stage after the first two or three verses. After the show, Morrissey's car drove by the exiting masses and many gathered around and ran after the car, some even briefly jumping on it. During the Boston show I was the one that was pulling Morrissey off the stage and he was trying to pull me on the stage during "Roys Keen". I got up and was being escorted off the stage and I ran back out to open arms and a smiling face and a greeting. It was probably the greatest thing that happened in my life. After the show I tried to meet the man but they wouldnt stop. While passing me Morrissey looked at me and started laughing and saying something to Alain. It was amazing he actually recognized me. After all that I was greeted by many fans and just wanting to hug me and congratulate. Even though I got thrown out it was well worth it. The audience seemed to be divided between those who knew the b-sides and those who didnt. When he ripped into "Nobody Loves Us," people like me rocked out while others stood stone-still and didnt seem to recognize it. 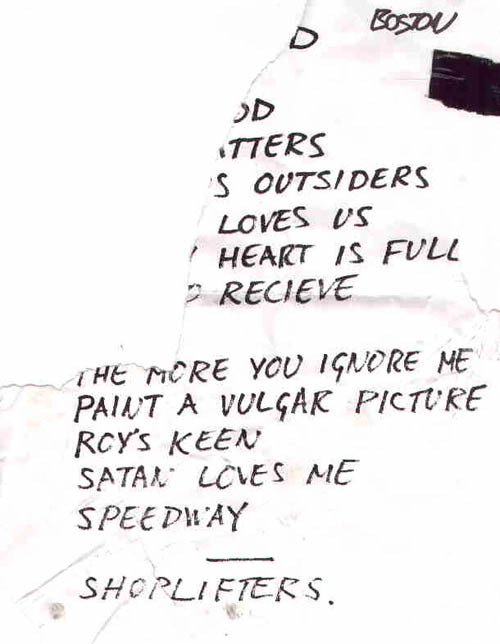 Couldnt have asked for a better set list: "Boy Racer", "Now My Heart Is Full", "Satan Rejected My Soul". Unbelievable! (the only one Id really like to hear live is "I Know Its Over," from The Queen is Dead. I wont hold my breath). The band was awesome, but Morrissey has so much charisma  it was hard to divert eyes off him to the band. He was playful with the audience, a bit sassy and mildly chatty (nothing consequential, but he made the effort). He was staged rushed about 8 times, strong people who got him in head locks and bear hugs and held on for dear life. He played one encore, a bring-down-the-house "Shoplifters Of The World." "Roys Keen" was a bit perplexing. A fun song, but not as emotionally charged to hear live for the audience after the likes of "Billy Budd" or "The More You Ignore Me." It was performed with verve and talent, but overall it seemed to curb the flow of the show, if only mildly and briefly. I was surprised the audience was so young. Id say one half to two thirds were maybe college freshman and sophomores. I expected a few more older people in the crowd, those who aged with the Smiths songs. Overall, a phenomenal night!